When it comes to your home, there are lots of things that will need to be replaced over time. Your roof is one of those things. A roof replacement is needed in order to create a more functional roof for your home, detached garage, or shed. There are a lot of benefits to replacing an aging roof. Moisture and dampness can develop into mod which can take over a roof very quickly. Mold can be harmful to one’s health. Breathing in mold spores over an elongated period of time will expose the risk for ailments. A roof replacement also fetches better resell value of your home. Buyers always keep an open eye out for dry roofs and an overall healthy look for homes. One thing a buyer wants is a roof without any damages. Your chances of getting more out of the home are possible. Asphalt roofing materials are inexpensive and built to withstand all weather patterns. They will normally last long if they are inspected every six months. They come in different styles, color options and can be installed very easily. Slate is a heavier type of roofing material. They need to have sub-structure in order for them to hold up. Slate is resistant to hail storms and insulates the home very well. They are often chosen for their variation of colors and styles. Cedar is an environmentally-friendly roofing material. It is a great option for those looking for a roofing tile with better insulating values. Cedar will keep your home cool in the summer and warm in the winter time. 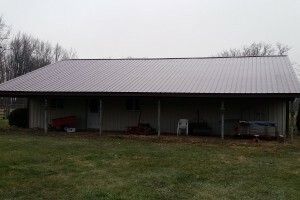 Metal roofs are one of the best ways to go as far as replacements are concerned. Metal is a durable material that is able to withstand fire and heavy winds. Metal is a cost-effective material that is great for all seasons. A professional roof installation will save you from getting hurt. Experts are trained in installations and can pull them off far more effectively than you can. Getting a replacement from a professional company could save you from getting hurt. Call Omni Builders for a roof replacement. It’s one of the best things that you can do to protect the life of your home. You’ll have a stronger structure and a roof that won’t need costly repairs. If you are looking for an experienced roof replacement expert in Tecumseh then please call 517-486-3784 or complete our online request form.